Your business contacts and email campaigns, now together. 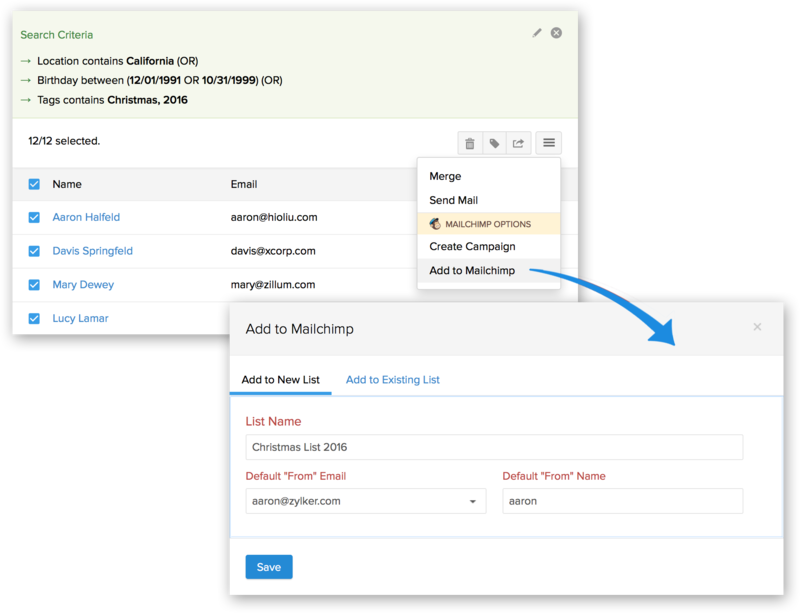 Zoho ContactManager integrates with MailChimp to make your email campaigns click with your contacts. 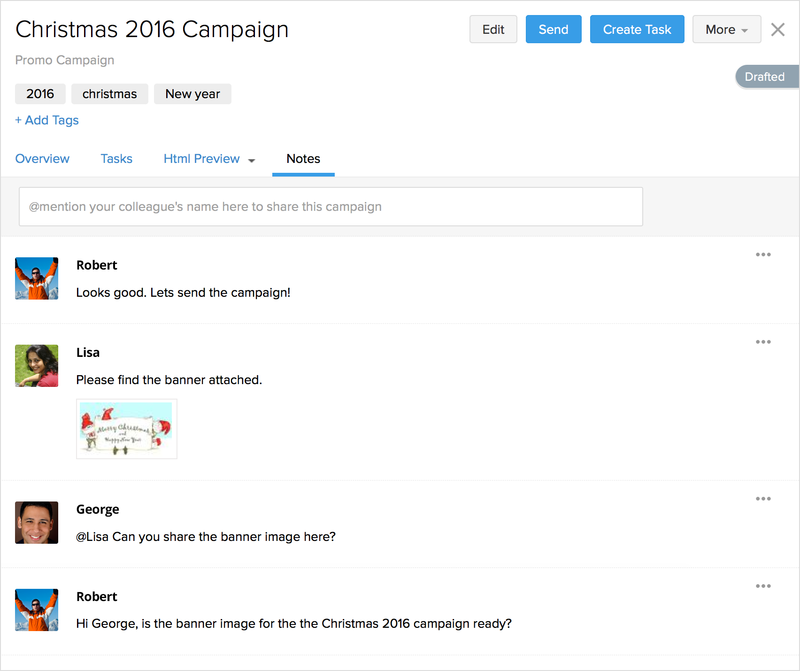 Now, you don't have to switch tabs just to send a campaign, or to sync your contact lists. Unified contact lists, seamlessly synced. Stop re-typing contacts and struggling with contact exports. Simply import your existing subscriber lists from MailChimp, and segment and organize them with tags. Your subscriber lists will be automatically updated in both applications —making duplicate contacts, outdated subscriber lists, and struggling campaigns things of the past. When you're ready to send out your campaign, nothing should get in the way. With our integration for MailChimp, nothing does: Sending an email campaign in ContactManager is as easy as sending a normal email. Back from a trade show? Just add the contacts you collected into ContactManager, tag them as a dedicated list, draft a campaign, position it accordingly with templates and themes, and warm those leads up in no time. 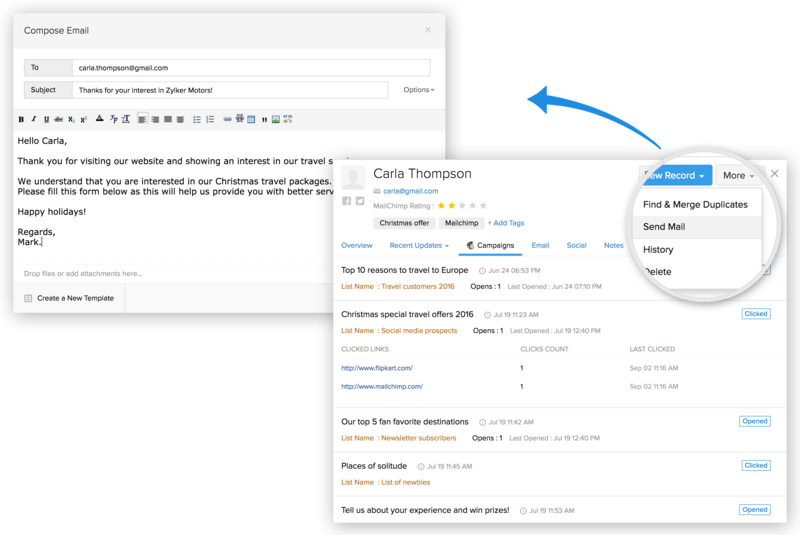 Jot down your ideas in a draft of an email campaign in ContactManager, assign it as a task to a team member, and schedule the final date for it to go live. Collaborate through comments, monitor work progress, and involve more team mates if you need to. Make sure your productivity isnt hindered, even if your teams are spread across different places. Wondering where you stand among your competitors? We provide you with average campaign metrics for your industry, so you can compare the average activity of a subscriber list with the industry standard. We also let you compare your success with, perhaps, the biggest competition of all—yourself! 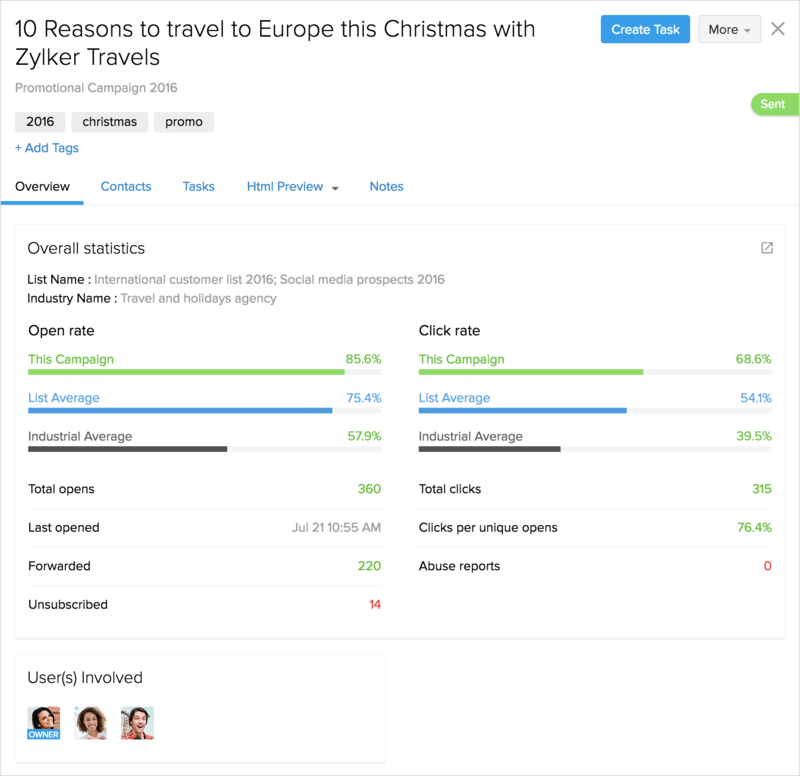 With metrics such as click rate, open rate, and unique clicks you can track how your campaigns have performed after you've sent them. Get personal with your leads. Understand them better. Not all leads are the same. To help you understand their needs better, we fetch you their MailChimp ranking where the leads are ranked on a scale of five stars based on the interest they express in your campaigns. Want to identify your star prospects and fans, and reward them? 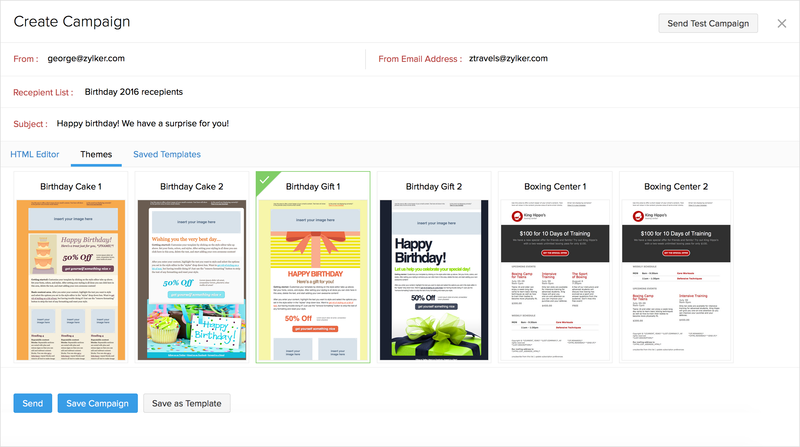 See your customer's action on your previous campaigns, add them to a separate mailer list, and send them personalized offers and promotions to keep them happy. Relevant campaigns equal better results. 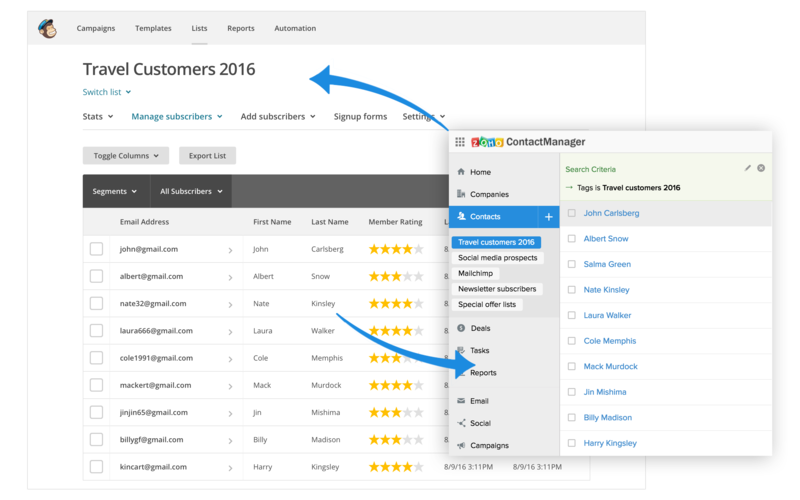 Zoho ContactManager's powerful search feature helps you segment your contacts according to age, location, gender, or any demographics of your choice. Once you identify the exact audience you want to target, add these contacts directly to an existing MailChimp list or to your own list right within Zoho ContactManager, and send them targeted campaigns.